Sushi Roll is one of my favorite conveyor belt sushi chains. If you are craving sushi, but do not want to pay the Jiro price to have some then conveyor belt places like the one in the picture are the way to go. Getting ten plates with two pieces each only cost me a grand total of 1050 yen. That is a great price for a college student budget. 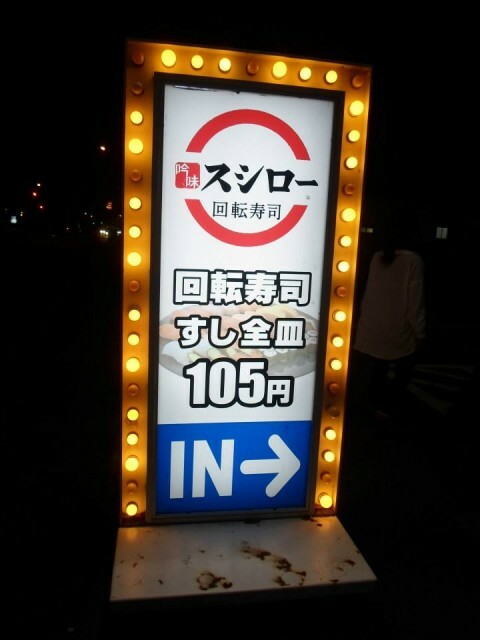 There are other pieces of sushi that cost more than 105 yen, but luckily all the ones I like were on the 105 yen plates. The system works out that you can grab the plates that are going around or you can order them from the screens they have available. Just be sure to pick up your order and not a stranger’s plate. Otowa Waterfall in the Kiyomizudera is split up into three streams. It is said that each stream has a benefit to those that drink from them. The three benefits are longevity, success in education and love. If you were to drink from all three streams it would be considered greedy so please choose one. There are ladles available for you to use. Truthfully I wanted to drink from one of the streams, but the line for it was super long. I should have gone before the crowd came in. 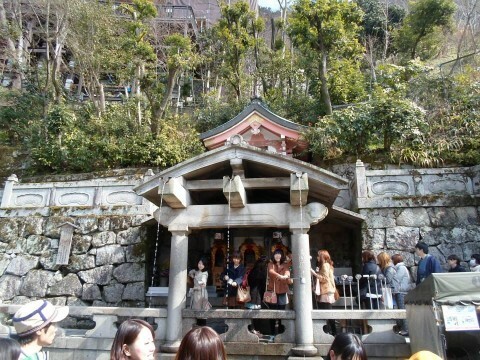 Still it is another interesting feature that you can find in Kiyomizudera. Walking around one of the streets in Kyoto we saw this little sign that said Studio Ghibli. We ended up in a store where they sold various goods of Studio Ghibli. They had stuffed animals, towels, handkerchiefs, etc. featuring characters from Studio Ghibli. 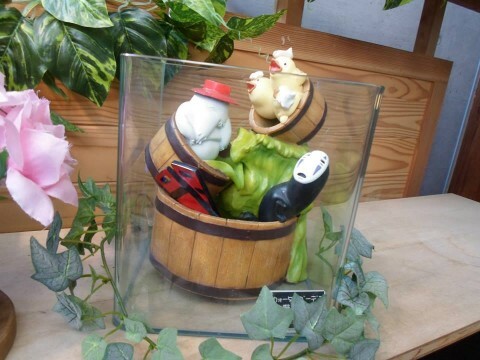 My favorite one was the Spirited Away figure in the picture that had the Radish Spirit, No Face and the Bird spirits. The details were so amazing that I wanted to buy it, but sadly I chose not to. Next time that I’m in the area I will for sure get it because the more I look at the picture the more I want it. Desserts in Japan look too good to eat. The cake in the picture is just one example of the quality you will see when you visit the country. I kept thinking that it would be a shame to ruin it, but that would be an insult to the baker. It was delicious. The goal when faced with something that looks too pretty is to get past the first cut. 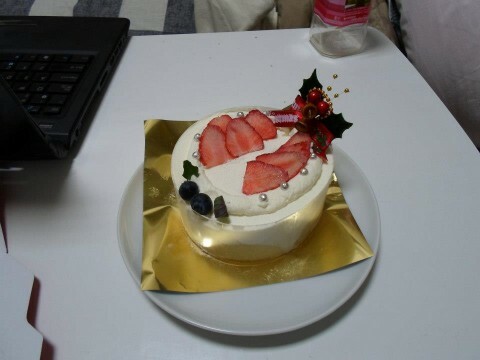 I still wonder where this cake from since my friend is the one that bought it. On a trip to Nikko my friends and I ended up wandering around the area. We arrived too late to enter the Toshogu Temple so we decided to go around. I remember we ended up at this alleyway where there these stone lanterns. There are a total of 37 lanterns in the alleyway that leads to the Futarasan Shrine. This dedication (houken, 奉献) dates backs hundreds of years. Each lantern has something different engraved on it. 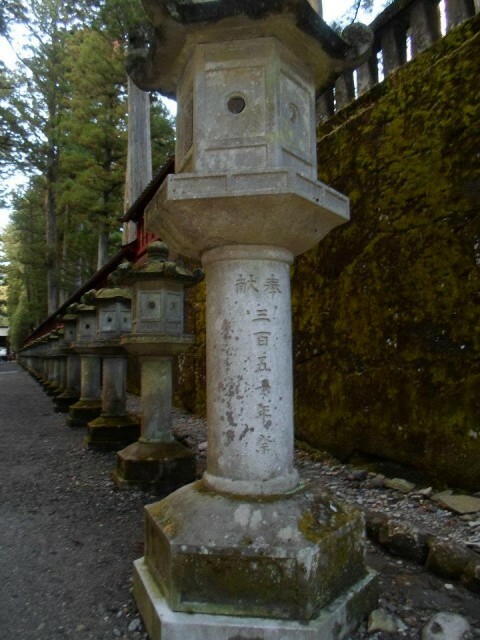 Walking past these stone monuments before entering the shrine area was enlightening. My friend said that each lantern has a haiku engraved on it. I do not know if that is true, but it would be great if it was.